We’ve covered the subject before, most recently in our review of the Blue Moon award-winning Cammino Powerline Harmonizer H3.1. Here's an excerpt from it: "Correct phase means that the equipment’s power supply is fed with its live lead connected to the properly corresponding pin of its power IEC. To determine proper power phase you need a cheater plug, voltmeter and alligator clip. The procedure goes as follows. Unplug all equipment from the wall. Disconnect all interconnects so that each piece stands alone. Now plug in the power cord of the piece you wish to test into the Harmonizer with a cheater plug (or into whatever other power bar or conditioner you have since this procedure is universal and not exclusive to the Cammino). A cheater plug accepts grounded plugs but lacks a ground itself to lift the connection's earth. "Now power up the equipment. In case of relays wait until they open. 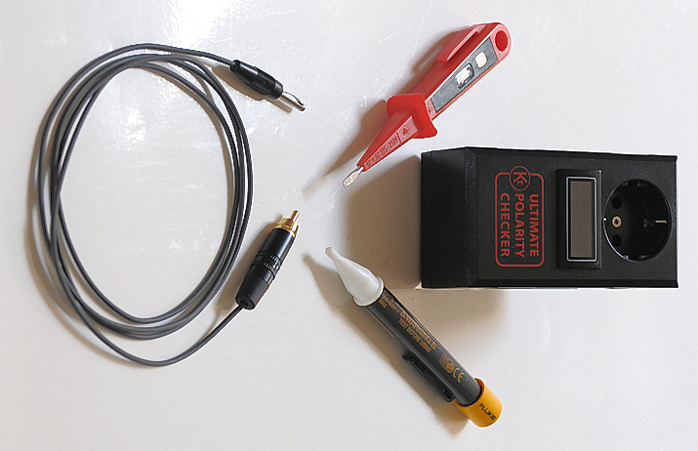 With your multimeter set to AC voltage, measure the voltage between the ground connection of one of the Harmonizer’s Schuko outlets and the chassis ground of the gear such as the outer rim of an RCA connector. Note the meter's voltage readout. Reverse the power plug in the Harmonizer (or distribution block) and repeat the measurement. Note the readout. Your notes will show two different voltages. The lower one is correct. You now have determined correct phase alignment. The above procedure remains valid and works outstandingly. You simply need the right tools for the job. That would be a multi-meter, cheater plug and voltage probe. Not everyone has those about. The procedure itself is a bit messy too but even though you have to go through a few hoops, the results in 90% of all cases will be very rewarding. A system with aligned phase—from here on we will use polarity to avoid confusion with pressure-wave phase from loudspeakers—will perform as a more united entity. Think North Korean military parade. All faces have the same expression without the odd man out. Perhaps that's a bit far-fetched a comparison but still. When individual components work harmoniously, the signal running through the chain encounters fewer obstacles. And that's audible. Properly polarized a system gains in attack rate and tightens up. As a result the image is larger and built upon a firmer foundation. That foundation includes the lowest possible noise because correctly power-phased the whole system avoids ground loops. 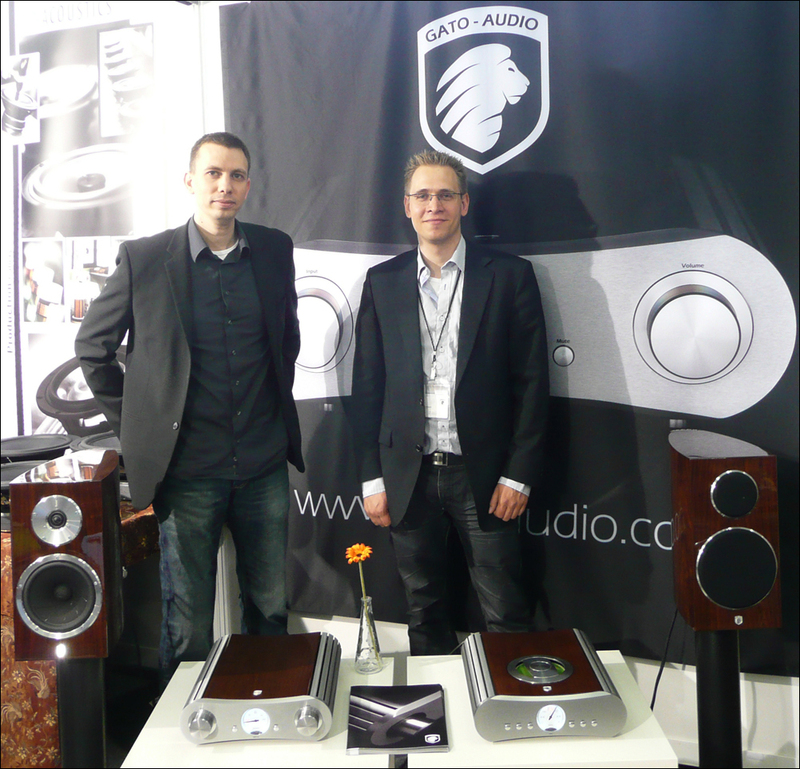 For audio (and video) reviewers a properly set-up system is of the highest importance. How else can you assess a component’s qualities if something down the line is running inverted from its optimal setting? One cannot rely on the manufacturer’s indication of where the live wire should enter his creation. That indication comes from an off-the-shelf IEC power inlet. How the wiring proceeds from that part is shrouded in mystery. The only thing we can rely on is the lowest voltage on the signal ground. With the lowest reading and proper power cord orientation you know what your equipment prefers. Fortunately for reviewers and everyone else who wants their system properly interfaced with the power grid there now is a simple solution. 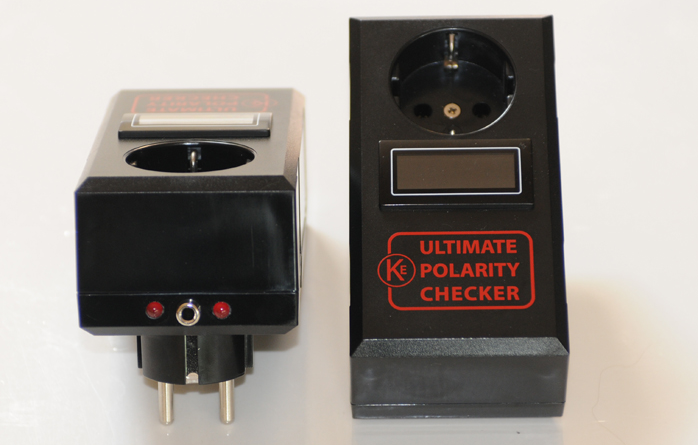 We’re talking about the Kemp Elektroniks Ultimate Polarity Checker or UPC. In his Amsterdam company Ron Kemp eats and breathes power. For many years already he specializes in power-related gear and consultancy. The UPC is a wall-wart kind of device measuring 7 x 12.5 x 5cm. At the back sits a protruding Schuko receptacle. The front sports a female Schuko connector. Halfway down the front there’s a red LCD display. The top of the 260 grams UPC has two red LEDs with a connector in the middle. Mind you that the UPC is Schuko only, i.e. made for European power outlets [this eliminates the UK, Denmark and Switzerland – Ed.]. Operating the UPC is child’s play. First make sure the piece of equipment whose power polarity you mean to test is fully unplugged. There can't be any connections whatsoever to any other equipment. Make sure there is no hidden connection either by way of a ground wire, a physical contact with another apparatus or a conductive shelf of some sort. Also don't touch the gear whilst taking your measurements. Now plug the UPC into the outlet you want to use for the component. Here we assume a grounded outlet with protective earth or PE. With the UPC plugged in, one of the LEDs on top will light up. This indicates which associated pin is 'hot'. It is advisable to mark that on the outlet soon.